Posted on Fri, Jan 20, 2012 : 5:59 a.m. Tight end Kevin Koger had 23 catches for 244 yards and four touchdowns this season. When Kevin Koger committed to the Michigan football program, he was signing up to play in a pro-style offense with a rich tight end tradition. Instead, he spent three years in the spread-option of former coach Rich Rodriguez — an offense that de-emphasizes the tight end — and his final year transitioning to the spread-West Coast. Now, he's trying to prove to NFL scouts and coaches that he's the same guy who was a top-five tight end coming out of high school. Kevin Koger on his future: "Everything is just so up in the air, and in four or five months, I have no idea where I’m going to be." "I just want to show everybody what I can do, my full capability," he said after a workout last week. "I didn’t have as much production as people thought I should have had over my career, but that’s fine. I just want to show everybody what I’m fully capable of." That starts with the East-West Shrine Game, an all-star game for outgoing seniors that will be played at 4 p.m. Saturday in St. Petersburg, Fla. (NFL Network). 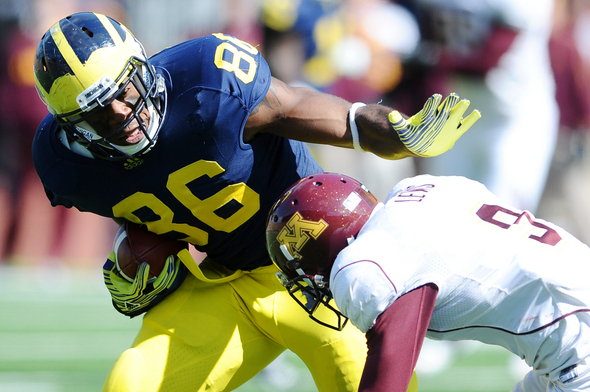 Joining him at the game will be former Michigan receiver Junior Hemingway. Koger grabbed 23 passes for 244 yards and four touchdowns this past season, all career highs, but finished his career with just 59 catches for 756 yards and nine scores. He's training for the draft with five former teammates at Barwis Methods, which is run by former Michigan strength and conditioning coach Mike Barwis, and hopes to make up for those modest numbers by impressing scouts at the Shrine game and the Wolverines' pro day March 15. He was not invited to the combine. "It’s kind of surreal," said Koger, who is rooming at the Shrine game with Western Kentucky tailback Bobby Rainey. "You come in as a freshman and you’re wide-eyed, and you don’t know what to expect in college. And then one day, you wake up and it’s all over and you’re training for the draft. "Anxious. I’m just anxious right now. I mean, I don’t know what it's going to bring. Everything is just so up in the air, and in four or five months, I have no idea where I’m going to be." ESPN NFL Draft guru Mel Kiper Jr. said Thursday he expects Koger, along with Hemingway, to be a third-day pick. An AFC scout told AnnArbor.com that Koger has proven he has good hands, despite his numbers, and also expects him to be drafted in the late rounds. The scout said Koger could strengthen his stock dramatically, though, if he shows improvements in the blocking game, especially down field. Koger said his biggest goal of the Shrine game is to do just that — and, so far, it appears he has, according to one ESPN review from Shrine practice. "Koger got after it as a drive blocker during the team period, staying low and creating good initial surge, then sustaining for the most part," the review said, noting his stock is up. "Koger also showed he can contribute as a short-to-intermediate receiver." Sports Illustrated also raved about Koger's week of practice, listing him as the No. 1 next-level prospect at the game: "Koger was lost for much of the past three seasons in a Michigan offense that had little use for a tight end, but he displayed NFL ability in a big way. "Koger lacks the foot speed to be a true downfield threat, but at a position that's thin on talent in April's draft, he could be the biggest sleeper of them all." Koger, ranked by ESPN as the 15th best pro prospect at tight end, continues to live in Ann Arbor with roommates J.B. Fitzgerald and Elliott Mealer. He said the hardest part of his transition to his post-Michigan days has been, of all things, Twitter. "That's the toughest thing," Koger (@KogerNotKroger) says, laughing. "I mean, you see the guys who are still on the team, like Devin (Gardner) and Tree (Roy Roundtree) and you see those guys interacting. That’s what I miss the most. I miss the camaraderie we had." Hemingway also has something to prove after a Michigan career that was stunted by injury and illness each of his first four years, one of which was redshirted. This year, though, Hemingway stayed healthy for the first time and earned the moniker "Big Play Hemingway" for his knack of hauling in deep catches in big moments. He finished with 34 catches for 699 yards and four touchdowns, and his 20.6 yards per catch was third in the country. He was named Sugar Bowl MVP. Hemingway's injury history is of concern to pro scouts. He's ranked by ESPN as the No. 36 receiver and is expected to be a late-round pick or undrafted free agent. Fri, Jan 20, 2012 : 6:34 p.m.
Go Mr. Koger!!! Let's try this again. Drum roll please..........The answers and winners are in for a trip to the NFL Combine....first the answers!! Day 1- Nas-CARR named after COACH CARR Day 2- Question does not count- see rules Day 3- COACH Hoke brings the donuts Day 4- John Navarre is everyones favorite Lead Foot Day 5-a.COACH LHCarr - famous words at a halftime interview b.coach Rodriguez- a little defense ??? c.COACH Hoke - Welllll you know........ translates to CARRS famous words d.COACH Big Al-Hamburgers and shishkababrs are an interesting combination e.COACH Mattison- 132nd to 8th....what can you say!! And NOW the winners.. Grand Prize- MEANgoblue2-sorry dude no name badge, luggage tags or Charles Bronson movies but you get to go to the combine!! 2nd place-ERM Ghost- you get the luggage tags...good night and good luck!! Last place- Who else THEO 212- you'll get nothing and like it!! Special Thanks to our sponsor the MCC Ann Arbor Chapter 52-14. Have a great MEEEEEEEEEEEEEEEEANchigan weekend girlies and bo's As we roll down to the combine and strike that heisman pose!! Fri, Jan 20, 2012 : 12:24 p.m.
What about Marrell Evans ?? No mention ? ?